The English civil war was the beginning of the modern age in Britain. While everybody knows that a King was executed and battles fought between Roundheads and Cavaliers, most people are unaware that, proportionally, more of England’s population was killed in this conflict than in either the First or Second World Wars. It had a huge impact on the country we know today. Yet, despite this, it seems to be an unfashionable era to portray in fiction, and I have come across relatively few novels set at this time. This made me all the more eager to read Peter Ransley’s new novel, Plague Child, the first in a new trilogy set during this tumultuous period. Ransley is a screenwriter by trade, with an impressive back catalogue of adaptations and original screenplays to his name (including the BBC’s memorable adaption of Fingersmith) – this is his third novel, although I have not read the previous two. Plague Child is set in London in 1641, a troubled time in the history of the city. The uneasy relationship between King Charles I and parliament was stretched to breaking point, and rumours of a forthcoming war between supporters of the two factions was rife. Protests and riots triggered by supporters of one side or the other were sporadically breaking out. Without a standing army, ordinary men who believed in one of the causes were training as soldiers in anticipation of what may come, leaving less time for them to provide the goods and services the city needed. London struggled on without enough food and supplies for its citizens, and those in it worried for the future of the country as it threatened to tear itself apart over its leadership. Amidst this chaos and uncertainty lives Tom Neave, an apprentice at the workshop of Mr Black, printer at Half Moon Court. Tom is an unusual boy, enjoying the upheaval in the city as it means his work as a runner for his master – taking hurriedly scribbled notes on parliamentary news from Westminster back to the print shop for publication as pamphlets – has taken on a new urgency and interest. He finds himself getting swept up passionately by the parliamentary cause and idolises John Pym and his speeches in particular. His own background provides more than enough uncertainty for him to be unduly bothered by events around him. Tom was a plague child, destined for the plague pits of Oxford as a newborn, but rescued by the plague cart driver Matthew Neave who heard him cry, realised he hadn’t died of plague and thereafter raised him as his own child. If that wasn’t strange a beginning enough, Matthew came to London with Tom very soon after that incident, choosing to live not in the city, but in the rather more law-free village of Poplar outside the city walls instead. Matthews’s family were also very poor – so how did a half-wild child who has never even worn boots manage to get a city apprenticeship? And most importantly for Tom, who were his real parents, who let him be taken away on a plague cart very much alive? Tom yearns to find the answers to his past, but must do so against the backdrop of a time of great upheaval and political uncertainty. This takes on a new urgency when, tasked with running a dictation of the Grand Remonstrances (parliament’s list of grievances against the king and a document that in Tom’s eyes were “words that could change the world”) he is attacked in the street by men who clearly mean to murder him. Tom escapes, but is this attack to stop the precious words that he carries – or to stop him? Plague Child is written as the first part in what is planned to be a trilogy about Tom Neave. Tom is quite an interesting character, rounded out by bad points to balance his hero qualities, although as the novel progressed I struggled to suspend my disbelief sufficiently to enjoy Tom’s adventure; some of the things happening to him were simply not that believable. For that matter, I was left wondering in places what it was about Tom that had so many other characters in thrall to him. He repeatedly lies, shouts and lets people down, yet everybody continues to give him second, third and fourth chances that in places seem to go against the run of the plot; Ransley seems to want to make Neave a rogue yet struggles to reconcile this with how other people need to treat Tom to keep the story moving towards the conclusion he wants. And it is not just chances Tom gets; part of the story reminded me quite strongly of Oliver Twist, as the theme of an improbable mysterious benefactor arises. In many places you can see the cracking adventure story that this should be emerging and the author’s attempts to provide an exciting world with muskets, swords and mystery without bogging the reader down in too much historical detail. Personally it is the historical detail I like in my historical fiction, and I would have liked to hear a bit more about Tom’s world and perhaps a bit less about Tom. The story is intended to be a historical thriller, and set against an interesting period that I confess to knowing little about, it should have been right up my street in terms of reading material. It was certainly historical and a good amount of research had clearly been done by the author, down to even providing a period map of London (period maps are always a good hallmark of a properly researched historical fiction in my book). On the thriller side, I was less….thrilled. Certainly there were plenty of twists and turns, mysteries revealed and solved, fight scenes and revelations, but I was never left on the edge of my seat or desperate to find out what happened next. 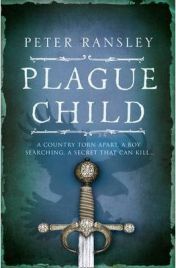 This is not to say that I didn’t enjoy reading Plague Child – I did, and I will keep an eye out for the rest of the series when they appear – it is just that it didn’t grip my attention and immerse me in the story as much as I would have liked. This was a book I snacked on rather than devoured. This was generally a well written book, and I thought the fight scenes were in particular very well handled. In some places, however, I found it to be over-written, with too many things happening in extremes. One thing that particularly annoyed me was the constant overuse of the word “pottage”. The characters all eat pottage – fine, that is historical fact. Tom rides a horse along a muddy road that is described as a pottage – great, that is a good image for the reader to work with. But after that so many things are compared to pottage that I sighed every time I saw the word – an editor should really have picked up on that. In many ways this book does have a very topical plot, with its background of civil war and uprisings against unpopular leaders. The casting of Tom as first as printer’s apprentice and then a pamphleteer shows the impact that that pamphlets – the forerunners of newspapers – had on the course of the war, and parallels will doubtless be drawn between this and the use of the internet in more recent events. This is bound to be a book popular amongst book clubs – there is even a session on possible discussions to have included as an appendix. I would certainly recommend it to book clubs, and judging by the reviews on Amazon, to readers from teenagers upwards who want an adventure story with sword fights, battles and quests. I would not really recommend it to fans of historical fiction, who might expect a bit more historical detail rather than history being used as an excuse for a bit of swashbuckling. I liked Plague Child – I just wanted to like it more. With thanks to Harper Collins for providing me with a review copy of Plague Child. No Comments on "Plague Child"